For fighter info, see Dark Samus (SSBU). Official artwork of Dark Samus from Metroid Prime 3: Corruption. Dark Samus (ダークサムス, Dark Samus) is a character from the Metroid series. Originally appearing as a gigantic, heavily mutated Metroid that plagued Tallon IV alongside the very toxic mutagen called Phazon, Dark Samus is the primary antagonist of the Metroid Prime trilogy and one of Samus Aran's greatest foes. Official render of Dark Samus in Metroid Prime 2: Echoes. This design is the basis of her trophy design in Brawl. When Samus Aran defeated the titular creature of Metroid Prime, it took one last grasp at Samus that stole her Phazon Suit before it dissolved into a pool of Phazon. 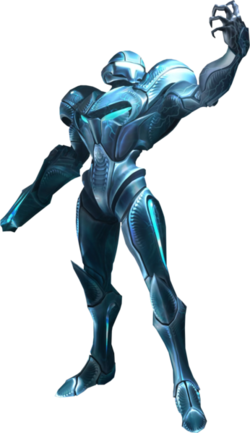 After Samus was forced to leave by the collapse of the area, Metroid Prime absorbed itself into the Phazon Suit, which caused it to merge with the suit and transform it into a living being. The new creature is a Phazon-based lifeform composed of both Metroid Prime remnants and parts of Samus' DNA that were stolen along with the Phazon Suit. Dark Samus is first seen by the Space Pirates in Metroid Prime 2: Echoes. They first believe she is Samus with a new suit and new goals, as she only steals Phazon the pirates are mining on Aether for her own sustenance. Her actions later result in the pirates' operation being discovered, leading to Samus' eventual arrival. Dark Samus fights Samus several times across Aether, prompting the pirates to consider an alliance with her, though this never occurs. Once Samus defeats the Ing and destroys Dark Aether, Dark Samus confronts her for the last time, but appears to disintegrate after losing. After her defeat, to begin Metroid Prime 3: Corruption, Dark Samus' remains are unknowingly collected by the Space Pirates as they clean up their Phazon mining operation, allowing her to reform. She absorbs all Phazon aboard the ship and corrupts the few pirates she leaves alive into serving her, before setting off towards her new goal: galactic conquest via the spread of Phazon across planets. Using the brainwashed pirates and a captured Federation ship's organic supercomputer, she takes control of planet Phaaze, the source of all Phazon, and attacks key Federation planets with Phazon-infused Leviathans that will in time corrupt them into Phazon-based planets. Samus manages to stop one of the destructive meteors, but Dark Samus arrives to infect her and three other hunters with Phazon. The other hunters all fall under Dark Samus' control, forcing Samus to kill them in turn, before eventually arriving to Phaaze and confronting Dark Samus for what appears to be the last time. 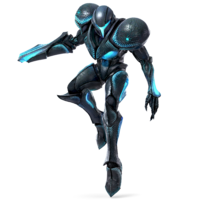 As a combination of Samus' suit and DNA, Dark Samus possesses all of her abilities, many of which are Phazon-enhanced. She is shown as intelligent and manipulative, obsessed with absorbing and spreading Phazon and transforming the host planet's random seeding into a directed spread of the substance. Dark Samus appears as a trophy and as a sticker. Additionally, a "Dark Samus" appears in Co-Op Event 7: Battle of the Dark Sides, though it is merely a blackened version of Samus and not the actual Dark Samus. It teams up with Dark Link against the two players that plays as their light counterparts, Link as player one and Samus as player two. Dark Samus trophy in Brawl. Dark Samus using Phazon tentacles as an attack. Samus and Dark Samus team up. Her first attack involves firing a volley from her Arm Cannon straight forward, dealing multiple low damage hits and knocking opponents away on the final hit. The volley deals 21% total, with low knockback. Her second attack sees her firing four homing laser spheres into the air. Each sphere deals 6% and moderately low knockback. The third attack only occurs if she is near an opponent, where she summons Phazon tentacles to erupt from the ground which deal 12% and moderate knockback. Before leaving, Dark Samus strikes a pose in which she holds her Arm Cannon in front of her face. Like several other Assist Trophies, she can be defeated if she takes enough hits. Upon being defeated, Dark Samus will disappear by fading out in a bright blue flash, similarly to when she is defeated in Metroid Prime 2: Echoes. Samus' Dark Samus color scheme. Dark Samus' color scheme is also the basis of one of Samus' alternate costumes. In an event match, this color scheme is used to simulate Samus battling Dark Samus. Similarly, the color scheme appears in a co-op event match that features several playable antagonists as opponents. This terrifying creature is made of Phazon. Along with regenerative abilities, she can also brainwash her victims and clone herself. Summoned into Smash Bros., she resembles Samus Aran and mimics some of her moves, firing Arm Cannon blasts, launching homing missiles, or even unleashing Phazon. An exceptionally strong and terrifying being made of Phazon. She's able to regenerate, brainwash her victims and even clone herself. When summoned in this game, she'll either fire rapid blasts from her Arm Cannon, launch homing missiles, or unleash Phazon across the surrounding area, depending on where her target is. Dark Samus, as she appears in Super Smash Bros. Ultimate. Dark Samus was confirmed to appear in Super Smash Bros. Ultimate as a playable character on August 8, 2018 during the first Ultimate-oriented Nintendo Direct. Unlike in Brawl and SSB4, Dark Samus' design is a combination of her appearances in Echoes and Corruption: her color scheme and organic textures are from the former, while her armor's design is from the latter. As an Echo Fighter of Samus, Dark Samus is virtually identical in function, although she does deviate from Samus in a few ways. Most notably, Dark Samus' rolls do not involve her transforming into a Morph Ball, but are compensated with slightly less ending lag. In addition, she references her Phazon-based weaponry and attacks by using the electric effect for all but two of Samus' respective flame-based moves. Dark Samus in Super Smash Bros. for Wii U. Full view of Dark Samus. Dark Samus firing her scattershot Power Beam at Mega Man. Dark Samus is the third of four summonable characters to become playable in a later installment. The first was Charizard, the second was Little Mac, and the fourth was Isabelle. Like Little Mac and Isabelle, she was an Assist Trophy prior to gaining this distinction. Dark Samus is the second playable character to be created outside of Japan, and the first to be created in the United States. She is also the second playable character not created by Nintendo to be solely created by a Nintendo-owned subsidiary (being Retro Studios). The first was Shulk, who was created by Monolith Soft. She is also the only female character to be created outside Japan. Dark Samus' Brawl trophy description is not entirely accurate. If the player achieves 100% completion in Metroid Prime, a cutscene will play that shows Metroid Prime's essence being reborn into Samus' stolen Phazon Suit. However, this fact is only hinted at in-universe from Samus' first logbook scan of Dark Samus in Metroid Prime 2: Echoes. Dark Samus, Palutena, Ridley, Piranha Plant, Wii Fit Trainer and the dog from Duck Hunt are the only playable characters in the Super Smash Bros. series that do not have a playable appearance in any other video game. However, if the Mystery Mushroom costumes from Super Mario Maker are counted, then Dark Samus, Ridley and Piranha Plant are the only characters in the series to hold this distinction. This makes the Metroid universe the only universe that has two characters with this distinction. Dark Samus, Wii Fit Trainer, Bayonetta, and Inkling are the only characters to have never appeared on a handheld console outside of the Super Smash Bros. series. However, if the Nintendo Switch is counted as a handheld, this does not include Bayonetta and Inkling. Dark Samus is the second playable female villain in the Super Smash Bros. franchise. The first was Wendy Koopa. Dark Samus is the second clone in Super Smash Bros. to also be an in-universe clone or copy of the character she is derived from. The first was Dark Pit. 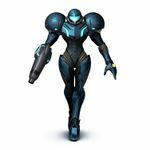 ↑ Although the Metroid Prime is genderless, Dark Samus is consistently described with female pronouns in Metroid Prime logbook scans and Super Smash Bros. trophies. This page was last edited on April 16, 2019, at 17:33.